A few weeks ago we did something out of the ordinary for our Sunday worship. Throughout our worship service, Mother Danae Ashley, our associate rector, paused to explain what we were doing and why we do it the way we do it. As the elements of the worship service were explained I realized how little I understood of the rich and ancient heritage that inspires the service in the Episcopal and many other mainline and Catholic services. And I realize that if I have little understanding of these than many others do too and it is easy for us all to criticize the forms and traditions of another form of service that is different from ours and that we do not feel comfortable with. This is another place in which we need to break down walls. We need to seek to understand why our brothers and sisters in others denominations and faith streams worship differently from us. So today and tomorrow I thought that I would share this instructed Eucharist. I have highlighted some of the explanations that particularly impacted me – either because I had not fully understood these before or because of how far back in the history of the church they are rooted. When we lose sight of this we lose sight of so much that is essential to our faith. Today we will look at the explanation of the liturgy from the beginning of the service until the scriptures are read which precede the sermon . Tomorrow we will move through the creed, prayers and to the Communion. I hope you find this as enlightening and enriching as I did. In Episcopal churches, our posture is part of our participation. So I invite you to stand for the opening hymn and the procession of the worship leaders into the church. We stand out of respect, and you might want to bow as the cross passes you. The central symbol of our faith is the cross. In this symbol of state execution, we see the presence of God entering into suffering, identifying with it, and transforming it. We bring to our worship our whole being. We pray not just with words, but with our every sense. We pray silently and we pray out loud, and we pray through music. 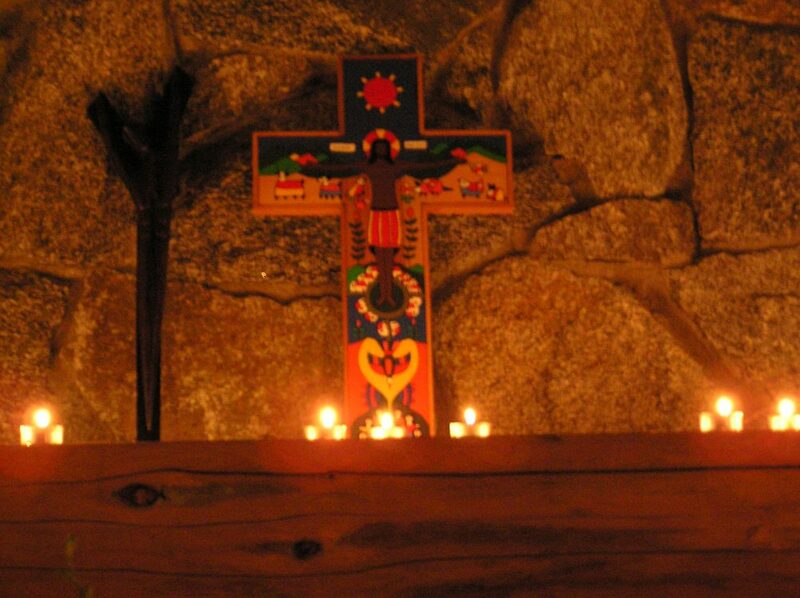 We pray by sight through the visual symbols that surround us. And we pray even with our sense of taste and smell through the bread and wine we will soon share and through the incense we sometimes use. We also pray with our bodies through actions like crossing ourselves, and through our stances of sitting, standing and kneeling. Most of these postures are optional, but we find them useful in helping to worship with our bodies and not just our minds. Typically, we follow the Jewish and Christian traditions of standing to praise God and to pray, sitting in order to listen, and kneeling in order to express penitence and devotion. week. They have come to offer themselves to God and to communicate with God in a very special way. We call this the Holy Eucharist. “Eucharist” is a Greek word for “Thanksgiving.” Eucharist is only one name for this service. Sometimes it is called the Holy Communion, the Lord’s Supper, or the Mass. But whatever name we call it, our Sunday Eucharist is the centerpiece of our worship and life together as a faith community. worship in the prayer book are derived from the earliest surviving texts of ancient Christian worship, updated and expanded as times and circumstances have changed. performers, but as the people of God acting together, each with their appointed part to play. love you, and worthily magnify your holy Name; through Christ our Lord. Amen. And then the appropriate Collect of the Day from the Book of Common Prayer. humanity with love and is calling for us to resist sin and live our full potential. Normally there are 4 lessons – one each from the Old Testament, Psalms, Epistles, and Gospels. until the birth of Christ. The Psalms invite us to recognize our different moods–from rage to jealousy as well as praise and joy; as we sing or say the psalm we are invited to trust that God understands those moments when we are bewildered, as well as those when we are happy. This practice of using a psalm after the Old Testament reading goes back to the middle of the fourth century. The Epistles (which means “letters”) help us discover the impact of Christ on the early Church. We’ll talk about the Gospel in a few minutes. Part of what I love about the readings in this form of service is how they have all been handpicked to move us through a progression of understanding the story of God. So often I misinterpret what Jesus is saying because I do not understand the Old Testament context that he is drawing from. the New Testament – Matthew, Mark, Luke and John, the biographies of the life of Jesus. The Gospel lesson is always read by a member of the clergy, and if possible, it is read by a deacon, to symbolize that a deacon’s special role is to lead us in taking the Gospel to the world. appropriate for us to stand up and turn to face the Gospel book and reader as a sign of respect. Law – into the congregation. The Gospel Procession does one more thing – it reminds us that we are to carry the Good News of Jesus Christ into all the world. We usually sing as we make this procession, often singing ‘Alleluia’ to express our joy in the Good News that God has come among us. God’s blessing “in my mind, on my lips, and in my heart.” This way of making the sign of the cross is one of the earliest known symbols of the Church, dating from the Second century. have heard and continue the conversation of what God is doing here in our community. How Do We Reshape Discipleship for the Future?